Axoporator 800A is the world's first commercially available single-cell electroporator represents the convergence of biophysics, cell biology, and molecular biology. A dedicated single-cell electroporation system, the Axoporator 800A makes it possible to electroporate individually targeted cells and provides precise control of voltage pulse and train parameters, resulting in optimized targeted delivery of ions or small molecules into a select number of cells in culture, in tissue or in vivo. Automatic and manual counters simplify tracking the number of electroporation commands. 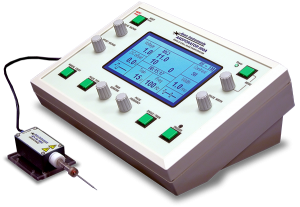 Voltage range up to 100 V provides the optimal voltage for single-cell electroporation, which can be up to several tens of volts in some preparations. Built-in audio monitor with headphone connector changes tone as you near a cell and make contact.